Among its several other medicinal uses, willow bark is most commonly used as a natural analgesic (just the fancy medical term for painkiller). Due to this characteristic, willow bark is known as nature’s aspirin. But willow bark is not called nature’s aspirin just because it can help with pain relief. The primary active component of willow bark was actually used to create aspirin. This natural component is called salicin. Salicin is natrually found in willow bark and is responsible for willow bark’s pain-relieving effects. When salicin enters the body, it is processed into salicylic acid, which is the chemical precursor to aspirin! In fact, in 1928 scientists figured out how to extract salicin and artificially convert it into salicylic acid. They discovered that salicylic acid can reduce pain and fevers. It was then eventually converted to acetylsalicylic acid which is what we call Aspirin today. 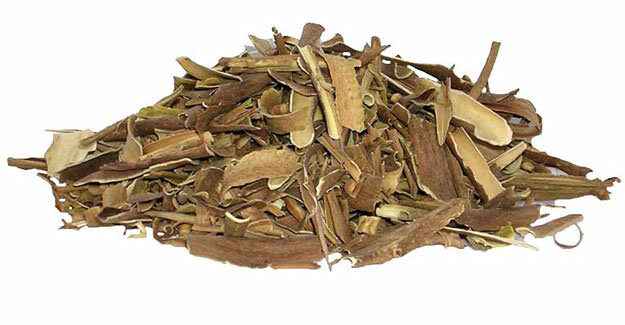 Medicinal willow bark is harvested from young willow trees that are around 2-3 years old. Using young willow bark makes the extraction process easier because the bark is not as tough and fibrous when it is young. Even though willow bark has been medicinally used for more than 2000 years for natural pain relief, we must determine if it is truly effective. Although not all of the proclaimed benefits of willow bark appear to be true, scientists have discovered that willow bark can be effective for the management of lower-back pain. Multiple studies suggest that willow bark extract can be effective for lower back pain relief . It was also found that there is a dose-response relationship between willow bark extract and lower-back pain relief . Simply put, more willow bark produces more back pain relief. By no means should you take as much willow bark extract as you can. Most studies never went above 240 mg of salicin per day (in a bark extract) which ends up being around 2000 mg of willow bark extract (depending on the salicin content in the extract you are dealing with). There is also some evidence (although the evidence isn’t very strong) that suggests willow bark extract can relieve joint pain caused by arthritis. One study, for example, found that willow bark extract is just as effective as conventional drugs for the relief of hip and knee pain caused by arthritis . So if you experience joint pain or lower-back pain, you may want to consider willow bark extract for your pain relief. Many people find that willow bark extract is superior to aspirin because it is easier on their stomach. If you haven’t already, try to figure out the root cause of your pain with your doctor because the long term use of pain killers (analgesics) should be avoided if possible. Analgesics only cover up the problem. Pain is your body signaling that something is wrong. If you have lower-back pain, you may want to check this article out: A Surprisingly Common Cause of Lower Back Pain & How to Find Relief. It talks about a muscle called the iliopsoas which is often (but not always) the culprit to lower-back pain. There are other potential medicinal uses of willow bark, but there is little to no evidence supporting these claims. This does not mean willow bark is not effective for these complications; it means the scientific community simply does not know or has not tested it. Feel free to try willow bark extract for these uses but do so at your own risk. If you are looking for a natural anti-inflammatory remedy, check out rose hips. In addition to willow bark’s ability to manage lower-back pain and joint pain, it contains several antioxidants—tannins and flavonoids to be specific. Tannins are chemicals found in most plant-based foods. In addition to their antioxidant and ability to lower blood pressure, tannins are thought to slow the growth of harmful bacteria, viruses, and fungi. Flavonoids are the chemicals found in plants that give them their red, orange or yellow coloring. They are an antioxidant and help cells repair damage. So you have read the information and are considering getting yourself some willow bark extract. Before you take willow bark extract, it is important to know how much to take, when to avoid willow bark and to be aware of the potential side effects. If you are looking to use willow bark as a pain killer, you can choose to get it as a topical cream (the studies did not cover this but you can read the reviews to see how people liked it) or as an extract. Some even buy unprocessed willow root and make a tea with it (but I have not tried this out yet). When in doubt, always follow the instructions on the product that you decide to buy. Unfortunately, the products do not tell you how much salicylic acid is in the willow bark products so it is impossible for me to calculate how much you should take if you want to take the same amounts as the studies (240 mg of salicin) used. Usually most extracts are around 10% salicin which makes the dosage recommendation of 2000 mg perfectly reasonable. So my best advice is to just start with half the recommended amount to make sure you don’t have an adverse reaction. Then work your way up to their recommended maximum or until you get the desired results (just never exceed the recommended dosage). If you experience any discomfort or rashes when taking willow bark, stop taking it immediately. In rare cases, people experience an allergic reaction to willow bark that shows up as a rash. Don’t give willow bark to children and never take willow bark consecutively for more than 12 weeks. See the complete list of warnings and potential side effects here. And of course, always consult a medical professional before self-medicating. This website and Holistic Beginnings Health Coaching LLC is for informational purposes only and should not be considered medical advice, diagnosis, or treatment recommendations. 1. Beer AM, Wegener T. Willow bark extract (Salicis cortex) for gonarthrosis and coxarthrosis – results of a cohort study with a control group. Phytomed. 2008(15): 907-913. 2. Chrubasik S, Eisenberg E, Balan E, Weinberger T, Luzzati R, Conradt C. Treatment for Low Back Pain Exacerbations with Willow Bark Extract: A Randomized Double-Blind Study The American Journal of Medicine. Vol 109; July 2000:9-14.